Normal sinus rhythm is a rhythm that starts in the sinus node (which is why we have the word "sinus" in the title). If you checked your heart rate right now and it was between 60-100, you are most likely in normal sinus rhythm. The sinus node action potential dictates the frequency of firing of the sinus node. The most important component of the action potential is phase 4. Notice that it is upsloping, always moving toward the action potential threshold (the dotted line). The fact that phase 4 is upsloping means that these cells have the ability to create their own heart rate. This is called automaticity. 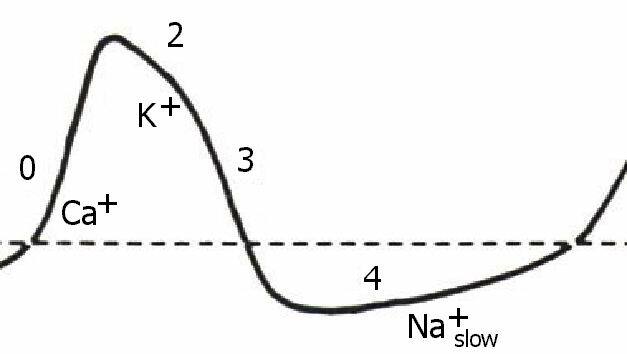 In particular, the slope of phase 4 is the most important component of the action potential for determining the heart rate. A steep phase 4 will shorten the time between action potentials and thus increase the heart rate. Increased sympathetic nervous system (SNS) activity or decreased parasympathetic nervous system (PNS) activity increase the slope of phase 4 and increase the sinus heart rate. The opposite is also true: decreased SNS or increased PNS will reduce the heart rate. Normal sinus rhythm is completely normal.